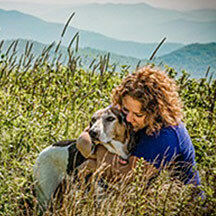 I moved to Asheville in 2007 because I was drawn to the beautiful mountains and all that they had to offer an outdoor enthusiast. My intentions were to only stay for a few years, and then move onto my next adventure as I had been traveling all over the country as a Traveling RN- specializing in Critical Care and Emergency Medicine. But I could not leave. I became involved in the local animal rescue scene very quickly and realized that there was not enough being done in the community to help animals. I also realized that there was no real sense of urgency to help save animals — even though, at that time, they were dying by the thousands every year. I created Brother Wolf because our community was yearning for a No-Kill organization that was grass roots and very much a voice of the community. We first started rescuing dogs only, but as my understanding, love, and respect for other animals grew, so did our rescue work. We have evolved to be an organization whose core ethic of Uncompromised Compassion extends to all animals — human and non-human alike. I am blessed to be living at the Brother Wolf Animal Sanctuary right now with my fiance, 6 dogs, 2 cats, 16 pigs, and 7 cows.